Pink Star Rabbit ceramic cup (can be used for soup cups or beverage cup) * Materials: ceramics * Suitable for microwave and dishwasher * Weight: 725 g Stars pink rabbit ceramic cup, wearing a brown hat and pink bow, is a more feminine star rabbit to rabbit's head for the stars lid, protection and insulation drinks. Cups are very suitable to the family, children, friends, lovers, cups with generous beautiful box packaging. 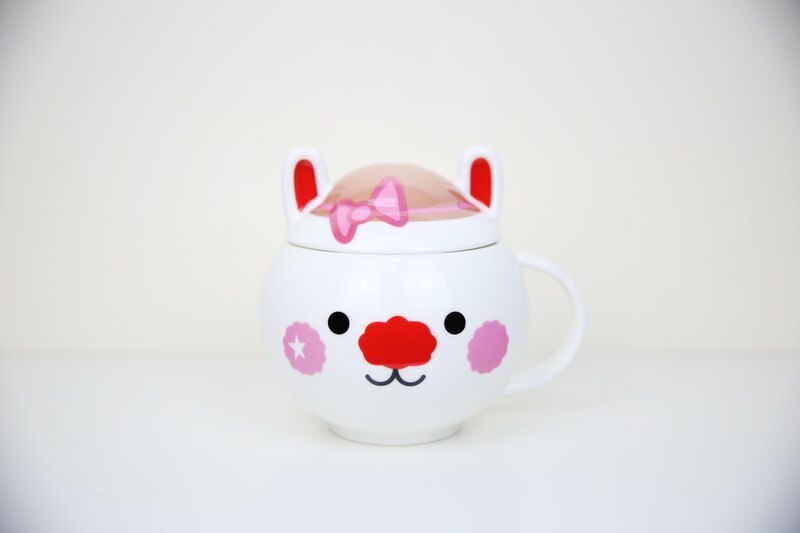 Cup has a positive QUOTE, Work Hard & Dream Big , adhering to the spirit of the stars of the rabbit, trying to encourage people to adhere to not give up the dream. 2014 successful shot space mv cartoon singer star rabbit founded cartoon creative brand is a multi-creation, on behalf of the dream spirit brand in Hong Kong itself is the singer's star rabbit last year to establish the product, which contains a stylish, lovely and noble different image I hope to meet the different levels and age friend. Hong Kong's well-known Asian diva Kelly Kelly and rabbit products are like the stars, only looked at her from the initial launch of the product with a limited record back fans, but now with just one year's time in Hong Kong has more than thirty points of sale. Even the recent South Korean buyers also negotiate with the stars rabbits introduced brand sales to South Korea, we can see the stars of rabbit products are very popular, is driving her home and sent to loved ones! May all your dreams come true! Star X 759 rabbit-linked activities multiply: https://www.youtube.com/watch?v=BBlLqw7rI-w Star Rabbit on space MV: https://www.youtube.com/watch?v=0MJQnY1XszQ Transit News: https://www.youtube.com/watch?v=qEZ-VcsfFmI New Monday Magazine visit: http://i1192.photobucket.com/albums/aa331/singsingrabbit/NM%20p1s.jpg http://i1192.photobucket.com/albums/aa331/singsingrabbit/NM%20p3s.jpg http://i1192.photobucket.com/albums/aa331/singsingrabbit/NM%20p2s.jpg Milk Magazine Product Reviews: http://i1192.photobucket.com/albums/aa331/singsingrabbit/Milk%20SSR%20product%201.jpg http://i1192.photobucket.com/albums/aa331/singsingrabbit/Milk%20SSR%20product%202.jpg Origin / manufacturing methods Hong Kong Monitor / Made in China / rabbit stars this product with care the manufacturers were Disney report, ICTI certificate, Sedex report verification, etc.